Preserve our cultural roots and ethnic identity by bringing together young Cypriots of our community. We are run with young Cypriots in mind and are dedicated to their needs. Provide support for local Cypriot youth organisations. Create awareness about the Cyprus issue. Raise awareness of the cultural inheritance of Cyprus and humanitarian ideals worldwide. Cultivate friendly relations between Cyprus and the countries in which Cypriots may live, encouraging and strengthening cultural, financial and other relations. NEPOMAK Discover Cyprus Programme (NDCP) – a 3 week language course and tour of Cyprus. So far, we have awakened a passion for Cyprus in over 500 young Cypriots (and counting!). 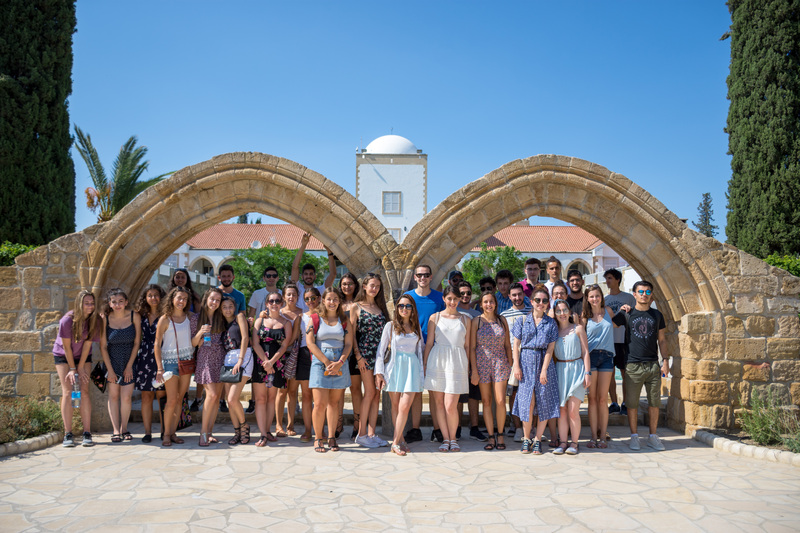 NEPOMAK Cypriot Culture Tour (NCCT) – a unique opportunity for young Cypriots to explore their heritage and culture through a 10 day professionally-guided tour. NEPOMAK Professionals – we bring together young Cypriot professionals from across the world through various networking events. The Cyprus Issue – we promote a just solution to the Cyprus issue for all Cypriots with various co-ordinated strategies. OUC Scholarships – we provide opportunities to study a postgraduate level degree through distance learning courses offered by the Open University of Cyprus, on a fully-paid scholarship. Internships – we have partnered with the Cypriot government, the United Nations in New York City and Cyprus Space Exploration Organisation to offer a variety of internship opportunities. Local events run throughout the year – we bring together young Cypriots from across the globe, promoting Cypriot history and identity. NEPOMAK is run day-to-day by 150 volunteers. We run activities in over 40 cities globally, directly reaching 15,000 young Cypriots around the world. Every year we are looking for more enthusiastic, driven, young individuals to help develop our organisation. By getting involved, our members have the chance to learn new skills, challenge themselves and develop life-long friendships. Sign up as a member with your local organisation today or e-mail info@nepomak.org for more information. How many members does NEPOMAK have? NEPOMAK has a global network of 15,000 young Cypriots across our eight regions around the world. What are the benefits of being a member of NEPOMAK? Registering for membership is quick and free. Once you are a member we will send you regular updates so you can make the most of your membership. Meet other young Cypriots (and make lifelong friends!) in your country and globally. Take part in our unique events and programmes. Learn more about Cyprus, our history, culture and language; benefit from local initiatives (for example – the UK Members Discount Card). Who can become a member of NEPOMAK? Anybody aged 18-30, who lives outside Cyprus, with at least one Cypriot grandparent is entitled to become a member of NEPOMAK. Is it free to become a member of NEPOMAK? Membership is absolutely free. And what’s more we promise not to sell on your details to any third parties or marketing agencies. Your data will just be used by us to keep you up to date about our latest activities. How do I become a member of NEPOMAK? Simply register today for free membership here and join our social network to meet other young Cypriots in your country. Can I get more involved in NEPOMAK? Absolutely! We are always looking for more people to get involved and help out. For more information click here to find your local branch. Is NEPOMAK a political organisation? No. As NEPOMAK we are not affiliated to any political party or organisation. We support the democratically elected government in Cyprus (whichever political party is in government). Fundraising events to support our activities (e.g. club nights, football tournaments). Donations and sponsorship from businesses and individuals. Our global initiatives (e.g. NDCP and conference) are supported by the Youth Board of Cyprus and Ministry of Foreign Affairs (Cyprus).